at Disneyland, Disney World, and Disneyland Paris! “Dynamite Rag” (“Trombone Troubles,” 1913), Paul Biese and F. Henri Klickmann. “Bring Me Back My Lovin’ Honey Boy” (medley two step, 1913), George L. Cobb. “Aviation Rag” (march and two step, 1912), Mark Janya. “Smiles” (slow fox trot, 1918), Lee S. Roberts. “Pineapple Rag” (1908), Scott Joplin. “Triplets” (xylophone solo, c. 1920), George Hamilton Green. “The Love Kiss” (concert waltz, 1908), Arthur Pryor. “La Belle Parisienne” (maxixe, 1914), M.L. Lake. “The Whistler and His Dog” (piccolo & whistling solo, 1905), Arthur Pryor. “Banana Peel Rag” (“Some Slippery Number,” 1913), Gus Winkler. “A Symphonic Nightmare: Desecration Rag No. 1” (1914), Felix Arndt. “The Jogo Blues” (1913), W. C. Handy. “Winter Garden Rag” (1913), Abe Olman. “Black Rock” (march, 1905), F. H. Losey. “I Wonder Whether I’ve Loved You All My Life?” (fox trot, 1918), Louis A. Hirsch. “Grizzly Bear Rag” (1910), George Botsford. “The Junk Man Rag” (one step, 1913), C. Luckyth Roberts. “Old Chestnuts” Waltz Medley (1920), arr. M. L. Lake. “Gold Dust Twins Rag” (two step, 1913), Nat Johnson. The Paragon Ragtime Orchestra’s second recording again features music from Arthur Pryor’s (c. 1869-1942) private archive of theater orchestra arrangements, as rediscovered by Rick Benjamin in 1985. 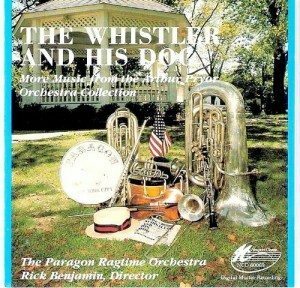 This CD includes some original Pryor compositions (including his most popular number, “The Whistler and His Dog”) as well as favorites by the era’s other leading pop composers – including Scott Joplin (“The King of Ragtime Writers”) and W.C. Handy (“The Father of the Blues”). This CD was produced by Thomas Frost, a multi-Grammy winner most famous for his recordings of Horowitz and The Philadelphia Orchestra, in legendary RCA “Studio A.” It is a fine recording, and one that you’ve probably already enjoyed without knowing it, since the Walt Disney Co. has played it daily as the “audio loop” for Main Street, U.S.A. at Disneyland, Disney World, and Disneyland Paris for many years. Indeed, an estimated 600 million people have listened to this recording as they’ve happily strolled down Main Street in those magical kingdoms. And now you can enjoy this great vintage American music anytime, anywhere.